Just in case you’re still wondering, yes, we are still waiting for the Indonesian forest moratorium to start. It was due to start at the beginning of January 2011, but it needs President Susilo Bambang Yudhoyono to sign a decree to make the moratorium legally binding. The moratorium is part of the US$1 billion REDD deal between Indonesia and Norway. Various drafts of the decree have been produced, but not made public by the government. REDD-Monitor understands that little has changed since three earlier drafts were produced (posted here – in Indonesian). Kuntoro Mangkusubroto, the head of the REDD+ task force in Indonesia, told Asia Sentinel that major corporate players were showing support for the decree – although it is not clear which version of the decree they are supporting. If they are supporting the version produced by the Ministry of Forestry, then we should not be surprised since it would apply only to primary forest (most of which is, in theory at least, already protected). Business as usual, in other words. Sinar Mas claims that it was never opposed to the moratorium, but declined to give further comment to Asia Sentinel. Unrelated to the Indonesia-Norway US$1 billion deal, in February 2011, Golden Agri-Resources, the palm oil part of the Sinar Mas group, signed an agreement with the Forest Trust, a Geneva-based organisation. Under the agreement, Golden Agri-Resources has committed to protecting forests and peatlands with a high level of biodiversity, or which provide major carbon sinks. Predictably enough, not everyone is happy about signing this sort of agreement with Indonesia’s largest palm oil company. Elfian Effendi, of Greenomics Indonesia, sent an open letter (pdf file, 545.2 KB) to the Forest Trust and Greenpeace. His questions are reasonable – and important – but he is still waiting for a response. Illegal logging (and illegal concessions) are an important “root cause” of deforestation in Indonesia. REDD-Monitor looks forward to posting responses from the Forest Trust and/or Greenpeace. Based on observation conducted by Greenomics Indonesia in respect of data on the issuance of licenses for the relinquishment of forest areas for oil palm plantations by the Ministry of Forestry (per December 2010), nine out of ten GAR companies do not appear on the list of companies that have obtained such licenses in Central Kalimantan province. According to the report of an audit conducted by teh State Audit Board (BPK) in February 2009, palm plantation companies that do not possess forest relinquishment licenses are acting in contravention of the forestry legislation and regulations, particularly Government Regulation No. 44 of 2004 on forestry-sector planning. The said BPK audit report also stated that the palm plantation companies operating in Central Kalimantan province that did not possess forest relinquishment licenses were violating Central Kalimantan Gubernatorial Decree No. 522.11/089/Ek, dated 3 July 2007, which was aimed at regents and mayors throughout the province of Central Kalimantan and which stated that for the purpose of ensuring orderly land/forestry administration, and legal and business certainty, oil palm plantation licenses granted for operations in production development zones (KPP) and settlement and other zones (KPPL) based on the Provincial Spatial Plan (RTRWP) for the 12 September 2000 to 11 September 2006 period must be accompanied by relinquishment of forest area licenses issued by the Ministry of Forestry. In the light of sampling results in two regencies in Central Kalimantan province, the BPK recommended that the Minister of Forestry direct the relevant regents to halt plantation operations in forest areas so as to avoid even greater environmental damage and losses to the state. On 1 February 2011, the Minister of Forestry and the Legal Mafia Eradication Taskforce have both acknowledged that only 67 of the hundreds of oil palm plantations in Central Kalimantan have secured forest area relinquishment licenses. They estimated that the losses accruing to the state due to illegal forest use in Central Kalimantan province as a result of oil palm plantation and mining operations amounted to some USD15 billion. Greenomcs Indonesia would like to question TFT as to the position under the agreement that was signed of the nine GAR companies that do no possess Forest Area Relinquishment Licenses, and to query what the formulation of the Responsible Sourcing Guidelines is in respect of these nine companies? As regards Greenpeace, Greenomics Indonesia would like to ask Greenpeace how it views this legal fact, and whether it will urge TFT to exclude the said nine companies from the implementation fo the TFT-GAR agreement until such time as they secure Forest Area Relinquishment Licenses? Greenomcis Indonesia would like to ask TFT as to the current legal-status of the forestry violations committed by GAR companies, as referred to in the Greenpeace reports, and whether TFT will facilitate legal enforcement in respect of these cases? Further, is TFT prepared to postpone the implementation of the said agreement until such time as the GAR companies comply with the law? As regards Greenpeace, Greenomics Indonesia would like to query its “cautiously supportive” stance on the question of the forestry violations committed by GAR companies, as described in the Greenpeace reports – bearing in mind that Greenpeace in its press release said that it was “Time for Government to back efforts like these,” referring to the TFT-GAR agreement. Further, is Greenpeace prepared to urge TFT to refrain from implementing the TFT-GAR agreement in respect of those GAR companies that have been shown to be in breach of the Indonesian forestry laws and regulations? This concludes our open letter. We would like to thank TFT and Greenpeace in advance for any explanations that may be forthcoming. If Illegal Timber is now illegal in the EU (although the law will not be enforced until the 3rd of March 2013) and the USA, then so should Illegal Palm Oil. Central governments are leading procurers of food (for schools, hospitals and prisons, including indirectly through privately financed provision on behalf of the state) and should, without further delay, establish procurement policies for palm oil. Processed food is a major end-use of palm oil. There is good precedent for such policies – from the procurement of wood-based products. Greenomics have very good reason to be doubtful about the agreement between Sinar Mas and the so-called Tropical Forest Trust, which is run by Scott Poynton. This is, after all, the same TFT that helped massage the notorious peasant-murdering Indonesian plantation company Perhutani through FSC certification, until the certificate was eventually cancelled, and similarly massaged the primary rainforest-smashing Congolese logging company, CIB, through FSC certification – which, amusingly, despite being lauded by Poynton as a major step forward in sustainable forestry in Africa, recently went bust and has been sold on (still FSC certified) to the equally notorious illegal logger, Olam. TFT is nothing other than a glorified PR company, helping some of the worst forest-wreckers clean up their public image. They have done immeasurable damage to the credibility of the FSC in the process. They have shown very little understanding of, or care for, the kinds of fundamental issues that Greenomics have raised – so it is hardly suprising that TFT have declined to reply to them; they probably haven’t got a clue how to. What for effects wil this have for gold mining corporations? Are you anti Indonesian Government ? Are you anti everything ? You appear to be anti REDD rather than neutral ? Your writing is very confusing and I wonder how you are funded ? Can you help me understand more about you ? @ Jono (#4) – You appear to be questioning my right to have an opinion about the Indonesian Government’s REDD policy (which you extrapolate to being opposed to the Indonesian Government). “I think you first of all have to ask what you mean by your country. Now if you mean by the country, the government, I don’t think you can be proud of it and I don’t think you could ever be proud of it, or could be proud of any government. It’s not our government, you know? And you shouldn’t be. States are violent institutions. The government of any country, including ours, represents some sort of domestic power structure and it’s usually violent. States are violent to the extent that they are powerful. That’s roughly accurate. If you look at American history, it’s nothing to write home about. You know, why are we here? We’re here because say, some 10 million native americans were wiped out. That’s not very pretty. I’m pretty sure that I’ve never claimed to be neutral on REDD. There are more than 400 posts on REDD-Monitor – I’m sure that from reading some of these you can work out my opinion of REDD. There’s a page explaining more about REDD-Monitor here and a page on my website explaining more about me here. Purely trying to understand what your site stands for rather than make assumptions, which this market appears to be making too many occasions. From what I can read you appear to be anti REDD under the justification of Indigenous people. Is this right? This being the case and people working with these groups, than why say they are not? Also you did not answer my question about how you are funded, as this is not a site of whim, rather a dedicated site with resourced articles. My concern for you is by taking a stance of anti Government, like Indonesia and clearly you advise you are living there, do you not see this as risky? Or do they sanction your anti REDD commentary as it gives them leverage for not ceasing deforestation. So I am jsut keen to understand your site, you etc and generate my own informed opinion of your site, you and the whole REDD thing. So as much information about you, your background, who funds you etc would be appreicated. you appear to be anti REDD under the justification of Indigenous people. Is this right? So I am just keen to understand your site, you etc and generate my own informed opinion of your site, you and the whole REDD thing. So as much information about you, your background, who funds you etc would be appreciated. @Jono (#6 and #7) – sorry about the delay in answering, but there’s no need to post the same question after three different posts (I’ve deleted the other two). I’m working on a “Frequently asked questions” page and your questions will be answered there. 1. My position on REDD: As I pointed out previously (#5), there are over 400 posts on REDD-Monitor. I am critical of REDD for the many reasons explained in these posts. To help you, there is a list of issues in the right hand side bar. Click, for example, on “REDD and rights,” to see a series of posts on how REDD risks marginalising indigenous peoples’ and local communities’ rights. 2. Whether I am “anti-REDD under the justification of indigenous people”: I think there are several reasons to be concerned about REDD. I am particularly concerned about carbon trading, as I have explained at length in posts on this website. Here’s one example: “Forests, Carbon Markets and Hot Air: Why the Carbon Stored in Forests Should not be Traded.” I am also concerned that the rights of indigenous peoples and local communities are unlikely to be upheld under REDD (see answer 1, above). 3. How is REDD-Monitor funded: Most of the work I do on REDD-Monitor is voluntary. Some funding comes from a group of NGOs with several decades of experience in forest campaigns, including the following: FERN, Rainforest Foundation Norway, Rainforest Foundation UK, Global Witness and Arbeitsgemeinschaft Regenwald und Artenschutz. None of these NGOs has any editorial control over what’s written on REDD-Monitor and what’s written on REDD-Monitor does not necessarily reflect their positions on REDD. Neither are any of these organisations in any way responsible for anything written on REDD-Monitor. 4. Whether I am anti-government: See my previous response to this question (#5). Can you give me any evidence that the Indonesian government is using REDD-Monitor to give them “leverage for not ceasing deforestation”? 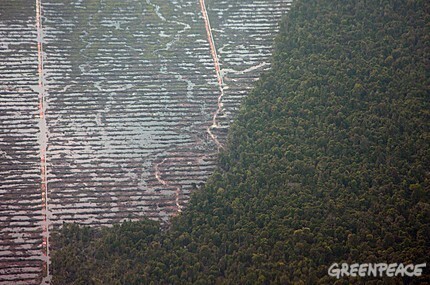 I think it is pretty obvious from the post above that I think that the government should reduce deforestation. I am concerned that the moratorium may end up being so weak that it will simply be business as usual.